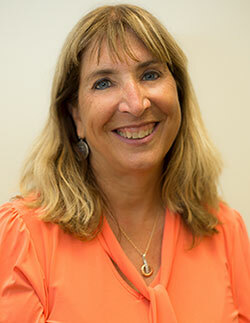 Photo Caption: Laurie McFadden, Library Director, Newark, received the Distinguished Librarian Award during the 2017 Berkeley College Faculty Recognition Awards dinner, held on November 2, 2017, at Battery Gardens in Manhattan, NY. “I received this award under the perception that I ‘stepped outside’ of the traditional librarian role,” she said. “In truth, I was doing what a librarian is supposed to do: Serve their community to make a difference.” Ms. McFadden is a resident of Montville in Morris County, NJ. 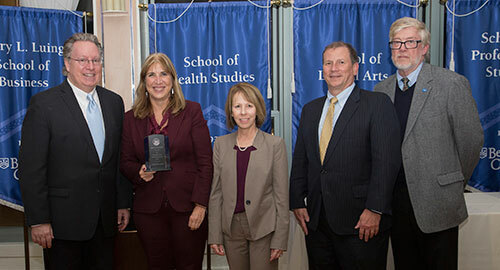 Below (L to R) are Michael J. Smith, President of Berkeley College; Ms. McFadden; Beth Castiglia, PhD, Provost; Kevin L. Luing, Board Chairman; and Michael McAteer, DBA, Dean, School of Professional Studies.